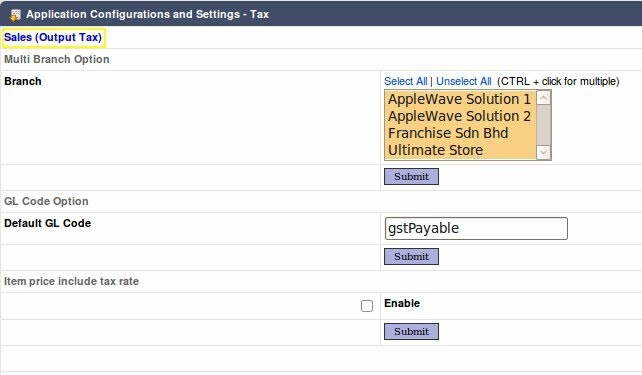 Under the Tax configurations screen, the configurations is divided into Sales and Purchases sections. Users will need to select the applicable branches from the list of branches. Users can either select by using the 'SELECT ALL' option or manually selecting one branch. For multiple selections, hold down 'CTRL' on the keyboard and click the branch name. After selecting, click on the 'Submit' button. Then enter the default GL code in the GL code option. There would be a drop-down list of GL code that have been created previously in the Accounting Module. Select the appropriate GL code and click 'Submit' to saved the selection.